Just in time for Memorial Day, Potawatomi Bingo Casino is saluting troops by making one lucky military couple’s dreams come true with a $20,000 dream wedding. You read that right! The contest is open to active military, guards and reservists, and is open from May 23-June 15. To enter, visit the Potawatomi Facebook page and share a story about your relationship. 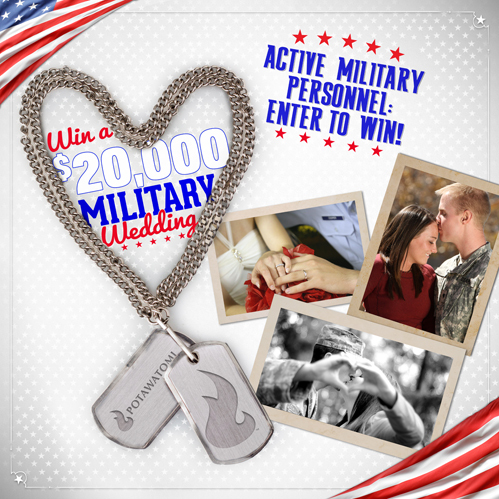 That’s not all – even if you don’t win, Potawatomi Bingo Casino offers a 20% military discount on wedding packages for all service members and veterans. Get full contest details here. Good luck everyone!